I bought my first Kate Spade bag the other week and couldn't be happier with it. I'm loving the light mint color, it seems like it goes with just about everything I own. I've already been wearing it to death. This weather has me wearing all kinds of happy and bright colors. I think sunny days in the 60's are my favorite. Hooray for Spring's arrival! What a cute top! I'm loving that bag, too. It's the perfect size! LOVE! I can't believe that is your first Kate Spade bag. I feel like it is soooo your style! You should totally get more, lol! Great purchase, and loving the sweater too! Love the KS bag. What a fun color...you can wear it with so many things. Love the colour of that kate spade bag :) and the coral polka dotted top is cute! Girllllll I love your Kate Spade! Super cute, lucky you! And looks so darling with that sweater! Love the polka dot shirt and the mint purse!!! Thanks Alyssa! It is the perfect size, I've been carrying it everywhere. Thanks Jill! It really does seem to go with everything. 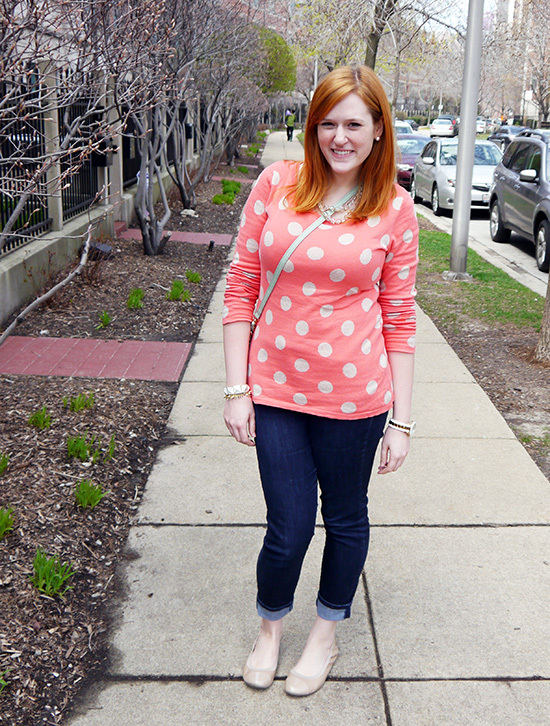 I adore your dotty sweater! Your K.S. bag is minty fresh and I love it. Ooo thanks for the heads up!! !